Brings humour and faith to science, politics and romantic comedies. A rich sheik has decided that he would like to bring the faith and sport of fly-fishing to Yemen. British fisheries expert, Dr. Alfred Jones (Ewan McGregor), thinks it’s a joke. But the PM likes the idea of positive Anglo-Yemeni cooperation and the 2 million potential voters who fish. Dr. Jones still thinks it’s a joke. The sheik transfers $50 Million over to his consultant’s firm, and thus the project begins. Dr. Jones still thinks it’s a joke. And that is where the film shines. The filmmakers don’t really treat it as if it’s a true story and keep the humour sharp throughout. It’s more closely related to a light-hearted romantic comedy rather than a sharp-edged political memoir. But this is where it shines, because it’s so much better than a light-hearted romantic comedy. McGregor allows us to experience the whimsical sense of humour beneath the scientific demeanor of his character. A character that I instantly connected with that has never been better written or portrayed as it was here. To me, the second best character was Sheikh Muhammed (Amr Waked). (Although at this point most people would prefer to mention the foul-mouthed press secretary by Kristin Scott Thomas). The sheik splits his time between the desert of Yemen and the beautiful flowing streams through the mountains and glens of Scotland. He wants to bring the serenity and faith that fly-fishing brings to his people in the Middle East. Dr. Jones fishes but he is not religious. The sheik found this a very confusing dichotomy in his character until they both realized that faith is not the same thing as religion. 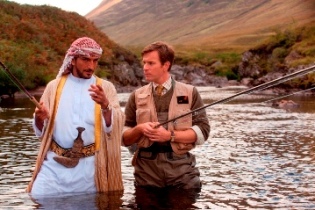 “Salmon Fishing in the Yemen” is very funny and approaches political satire level. We know, and Dr. Jones knows, that fish do not survive in the desert. So obviously this is all a big joke, but as we also all know, money and power outweigh common sense. But it starts becoming clear that this might actually work after we realize that the sheikh is driven by faith – not religion, nor money. Then the media comes in and creates war heroes and emotions out of nothing. As I said, the film is very funny but it doesn’t skewer the politicians or media as much as we would want it to. At that point it becomes a romantic comedy. The genre shouldn’t really matter though because it is very cute and charming and enjoyable on every level. I’m assuming the book focuses more on the political and engineering maneuvers required to bring salmon to Yemen; here we just stuck with the characters. But I did love these characters. The Ides of March (2011) - The games people play to get ahead, not necessarily in politics, but within themselves.